Definition - What does Baddha Parsvakonasana mean? Baddha parsvakonasana is the name of a challenging standing yoga bind that requires balance and flexibility with the legs in a virabhadrasana lunge position. 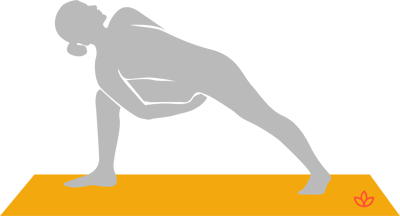 It is a bound version of utthita parsvakonasana (extended side angle pose). To create the bind, one arm reaches behind the back and the other threads between the legs so the hands can clasp. The name comes from the Sanskrit, baddha, meaning “bound”; parsva, meaning "side" or "flank"; kona, meaning "angle"; and asana, meaning "pose" or "seat." The common English name for this asana is bound side angle pose. Traditionally, baddha parsvakonasana is believed to activate the manipura chakra, which is the body's energy and vitality center, transporting confidence, internal strength and courage. Activating the manipura chakra through this asana is thought to dispel fear and insecurity. As well as a range of physical benefits from strengthening the legs to opening the shoulders, this asana is thought to relieve mental and emotional stress, improve focus and provide freedom from limitations. A variation of baddha parsvakonasana is parivrtta baddha parsvakonasana, In this posture the torso revolves in the opposite direction, creating a more intense twist and stimulating the abdominal organs.